from 1 July 1848 to 30th June 1849. 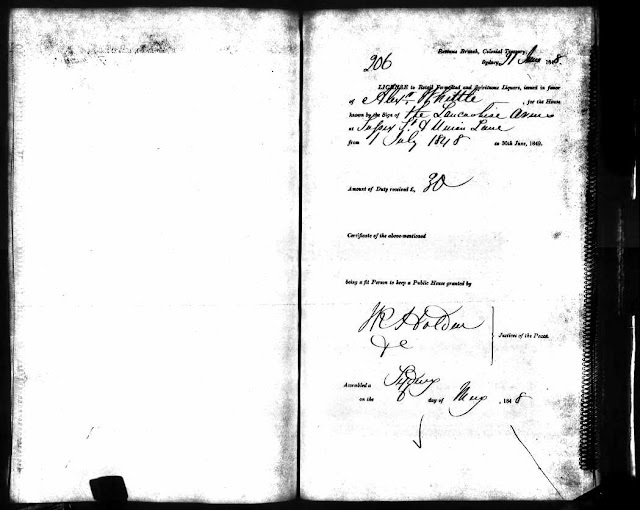 "New South Wales, Australia, Certificates for Publicans' Licences, 1830-1849, 1853-1899," indexed database with record images, Ancestry.com (http://www.ancestry.com : accessed 27 May 2011), 1848, #206, Alexr Whittle public house license; citing Butts of publicans’ licences, 1830-1849. NRS 14401, reels 5049-5062, 1236. State Records Authority of New South Wales, Kingswood, New South Wales, Australia. I found this record in my computer digital files for Alexander Whittle; I received it from Lisa Nap of the Netherlands in 2011. I wrote more about this and similar records in Finding the Alexander Whittle Pub in Sydney with Lots of Help From my GeneaMates (posted 2 March 2015). Alexander Whittle (1818-1853) married Rachel Morley (1821-1861) in 1840 in Bolton-le-Moors, Lancashire. They migrated to Australia in 1841 on the ship Brothers, and had six children. They lived on Sussex Street in Sydney and was the proprietor of the Lancashire Arms Public House. Alexander and Rachel (Morley) Whittle are my wife's second great-grandparents through their daughter Jane Whittle (1847-1921) who married Elijah McKnew (1836-1912) in 1865 in California.